I bet the moment you saw the title of this post, the recently released movie- 'Shuddh Desi Romance' came to your mind! Previously, 'Shuddh Desi' referred to Ghee! Like Shuddh Desi Ghee ke Laddoo or Paranthey! But, now it's about the 'Romance' in a Hindi Movie! Okay, I have absolutely no qualms about this. But, my views may be considered prudish! 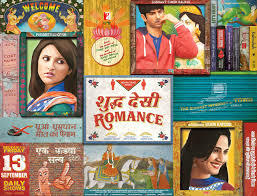 I loved the previous movie- 'Band Baja Baraat' of Maneesh Sharma, the Director of 'Shuddh Desi Romance'. "52% conservative Indians may not be coming for this film. WE ARE AT A CINEMA NEAR YOU TODAY"
I belong to a 'conservative Indian' family. I had an arranged marriage. I am not comfortable with the idea of 'Live-In' Relationship*. But, I am young at heart! I am a great Hindi Movies Fan! I love the catchy songs and the youthful energy of the film. I have a Movie-Ticket Voucher that I have to use before September 15th! Still, I find myself debating- Should I go for 'Shuddh Desi Romance'? Know that I can't/mustn't take my kid for the movie. Waiting for my hubby to be back in town so that together we can watch the movie! Can do with some extra 'Romance' and 'Entertainment' Hindi Filmy-Style! However, in 'Shuddh Desi Romance', the action is set in Jaipur. The Hero is a tourist-guide who is in a 'Live-In' Relationship with Heroine#1. Hero & Heroine#1 sing, laugh, dance, frolic in every place...even the terrace! All would have been fine had the Hero not had a roving-eye and zeroed in on Heroine#2. Hero shares 27 kisses with Heroines 1 & 2! Recently, the movies 'Ashiqui 2', 'Nautanki Saala', 'Murder 3'; 'I, Me, Aur Main', 'Bachna Aye Haseeno'... also dealt with 'Live-In' Relationship. Do film-makers show this as it is 'cool' to be in such a relationship? To be 'married' is boring? Are they trying to show that the characters are independent and have a mind of their own? And assert- 'I DON'T CARE what the Society thinks..'? Some may argue that a Film i.e. Reel-Life shows what is already happening in Real-Life! In reality, the Hero, Sushant Singh Rajput, is in a 'Live-In' Relationship with TV-actress, Ankita Lokhande, his long-time girl-friend. But, Real-Life mirrors the Reel-Life too! My Mom said that after the Super-hit Hindi Film 'Bobby' released, there were many newspaper-reports of young adults eloping from their homes, just like the protagonists- Dimple Kapadia & Rishi Kapoor had done on screen! Am sure that 'Shuddh Desi Romance' should 'inspire' many of this generation! Note- 'Live-In' Relationship is never 'Shuddh Desi'; rather a concept that's 'Videshi'! India has always had traditional values that are fast making way for such modern thinking and living. True that Polygamy, Polyandry, Concubines...all have had their share in Indian History. In the Ramayana, King Dasarath had four wives. For a vast majority of the population, a single-partner has been the norm. I do not personally know of anyone indulging in 'Live-In' Relationship in my neighborhood or friends-circle! Even if I did, I'd have been absolutely fine as it is their life and they have every right and freedom to decide how they wish to live! They are free to live as per their whims or wish! Who am I to judge or be the 'Kebab Mein Haddi'? Just that with my traditional values and upbringing, I would never have gone for it nor will I ever! They say- 'Never Say Never'. But, I am clear about what I want and how I wish to live, just like the people who decide to go for 'Live-In' Relationships are sure of what they want! There's a brand of Jeans named- 'Live-In'. The closest I can get is to- try a pair of 'Live-In' Jeans for the ease and comfort, just like what the relationship of marriage offers! Watching 'Shuddh Desi Romance' with my hubby (provided he agrees to the 'date' with me!) should be an enlightening experience! Incredible India, You have come a long way truly! Note- These are my personal views! I am like this only! I respect your views and outlook. Please feel free to share what you feel. Do comment in the 'Post a Comment' section below! It'll be wonderful to hear from you! Totally Bakwaas story getting all great reviews. 2.5 stars only for outstanding Parineeti Chopra, pretty Vani Kapoor and enjoyable first half due to good direction and music. But pretty bad that 2 intelligent girls keep falling for a dumb good looking dude who runs away from his marriage and later asks the same girl how she had felt that time. Ok that these guys want to live together but why they keep running away on the wedding day time and again nobody knows. People run away from marriage only if they love someone else or if they are not interested in marriage in the first place. But here the guy agrees for the marriage, leaves his beautiful to be bride for some other girl whom he was not even sure of meeting again; & forget about proposing to her. Guys don't behave like this. They get married and later start an extra-marital affair if it works. Later one of the girls runs away when the boy seemed committal and then comes back again. WTF? She could have talked to him, cancelled their marriage and lived together without marriage. The other girl who was ditched on her wedding day wants the same boy to be her boyfriend again when they met later. ???? Normal girls would have just ignored him or given him a tight slap. In all there is nothing pure, desi or romance. It is a story of fake confused characters with videshi values who think physical bonding is romance. Where is the heart and where are the emotions that bind two people in love? Thanks a lot for your in-depth analysis and comment on the movie! You know what? You can actually post it as your review to magazines like Filmfare. My Blog now has the most detailed comment all thanks to you! I haven't watched SDR yet. I planned to watch it and then check the match between my post and the film and write a review for it. Actually, all the stars are great actors and can pull off the flimsy story pretty well. There's no doubt that they will influence some youngsters to do so! As the song goes- "Jhootey Samaajo Mein, Jhootey Riwaazo Mein..."
It's up to us what we wish to adopt and how we wanna live! How much you will like or not like Shuddh Desi Romance largely depends on which side you are? Marriage or no marriage. I am not going to take any side because it's a movie not documentary. There are crazy characters and crazier situations. Beautifully filmed completely in Pinkcity Jaipur, written with fire-cracking dialogs, narrated smoothly however not consistently and acted strongly by Sushant Singh Rajput, Parineeti Chopra and Rishi Kapoor. Vani Kapoor comes just good enough in her short role.Sushant is charming and gains your sympathy despite being insane. Parineeti gains the points on being spontaneous and emotionally cracking. Rishi Kapoor is excellent and hilarious. Movie travels smoothly until its last half an hour struggles to wrap up the things and conclusion does not come shining enough. Love it or hate it but you won't be able to ignore it. Thanks for stopping by & for posting your views. Yes, we are entitled to our own thinking & attitude. Indian society and values are undergoing a change.